With our recent move, my hubby now has a shop for all his tools in an old quonset no one was using, and with summer vacation I’ve had a little more time for projects I’ve been meaning to do for months. I’d like to share my last little project with you, which we did last week before all the craziness of harvest started (more on that later). Oh, and there is the craziness of school starting in a week and a half… I do believe I should probably go set up my classroom and get some lesson plans done! Why can’t I just do fun projects all day? Sigh. Anywho, Hubby and I found this little desk at a garage sale last summer for $15. I liked its size and two drawers, but not so much its color. It just looked kind of blah, really didn’t match anything we had, and was scratched and scuffed all over. I meant to paint it all winter but just didn’t get to it with the wedding and school and the move. Speaking of moving, I have finally put this desk to good use since we moved to our little modular home in the country. In our previous house, I had a built-in desk in the kitchen which I used all the time, and Hubby had his own space for an office. Here in our little modular home, one spare bedroom is, well, the spare bedroom and storage space. We turned the other little bedroom into an office. Hubby set up shop in the office, but I decided I’d rather put this little desk in the living area and keep it stocked with a few supplies and power cords that I use a lot. 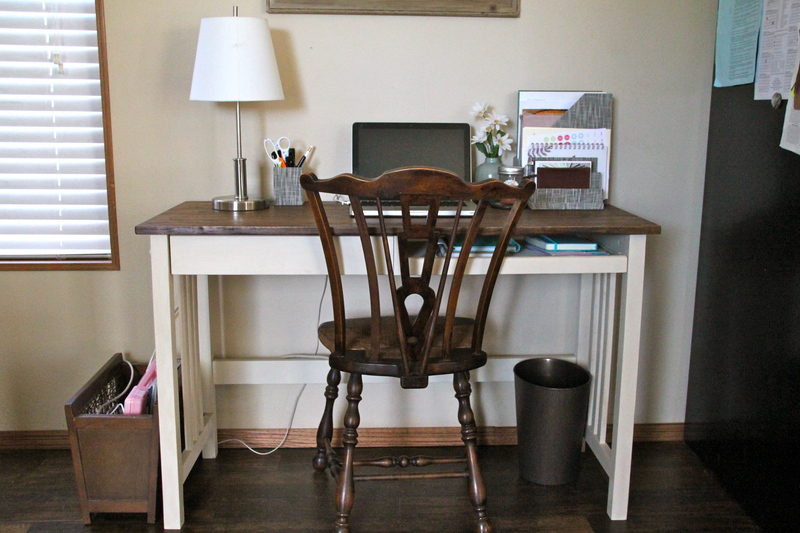 I do a lot of blogging, photo editing, and Pinning on this little desk. It’s extra convenient because I can look up recipes and still be near the kitchen. The time finally came to get this desk spruced up. I’d heard a lot of good things about Annie Sloan chalk paint and decided to pick up a quart in Bismarck at Eco Chic Boutique, which carries Annie Sloan paint, brushes, and wax. If you don’t know much about chalk paint, it gets its name from its thick chalky texture. It is NOT the same as chalkboard paint, which is also popular right now. Chalk paint is a hit because you don’t need to do any sanding or prepping beforehand, no matter what you are painting on. That sounded good to me! At Eco Chic, I picked up a quart of the color called Old Ochre, a pretty antique off-white which is exactly what I’d envisioned, and a can of the soft wax which is recommended after painting. (I also impulsively bought a quart of Duck Egg Blue because I liked it so much.) The cost of a quart of chalk paint is kind of shocking, but once I actually used it, I found the cost to be well worth it. It definitely lived up to the hype! 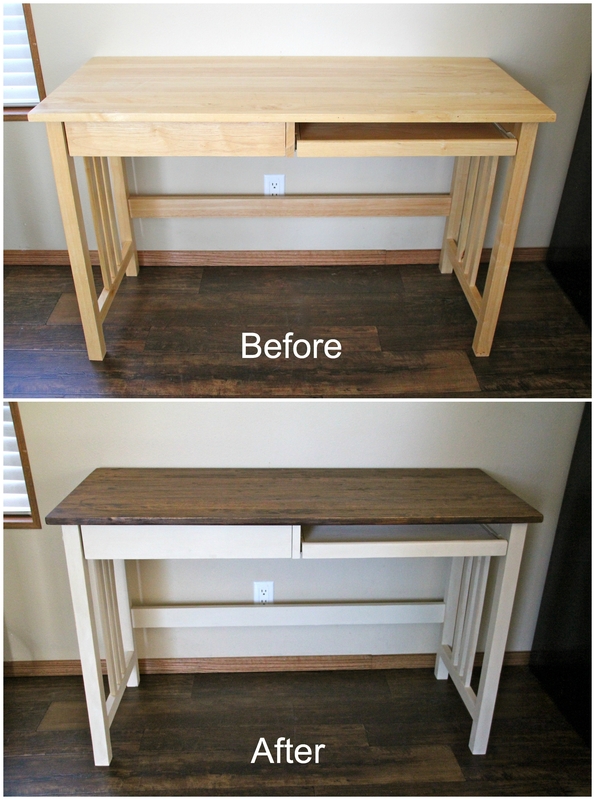 I also decided that rather than paint the whole desk with the Old Ochre, I wanted to stain the desk top to a darker, richer wood hue and paint the base with the Old Ochre. I’d seen some examples of this online and really liked how it looked. 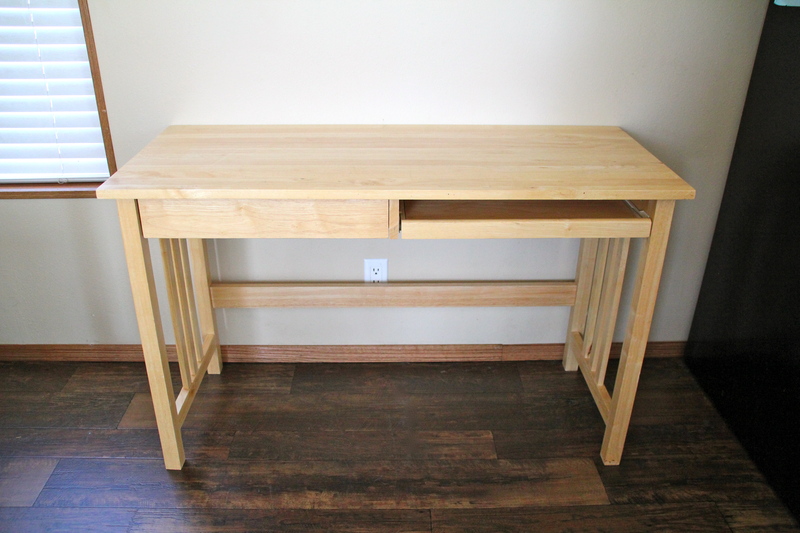 First, we took off the drawers and hardware and moved the desk to the shop. 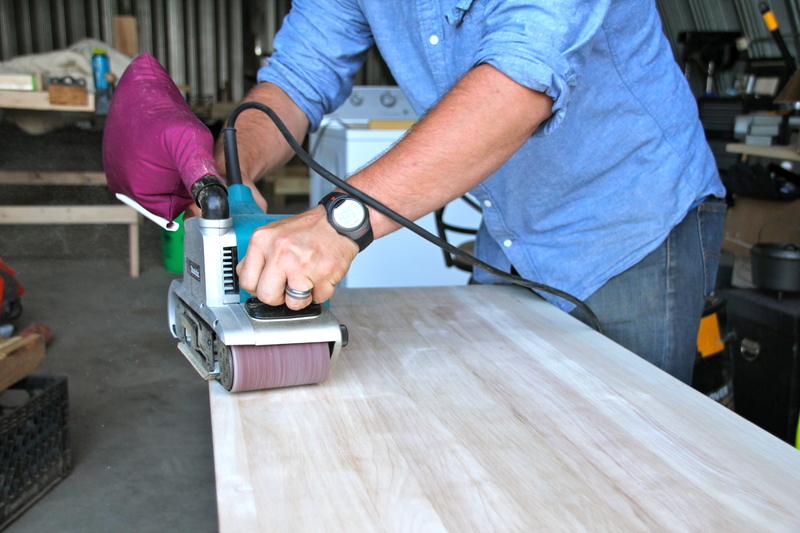 Hubby sanded the desk top with his belt sander. Remember, this would not be a necessary step for the chalk paint, but because I decided to stain the top instead, we had to sand down the old varnish. 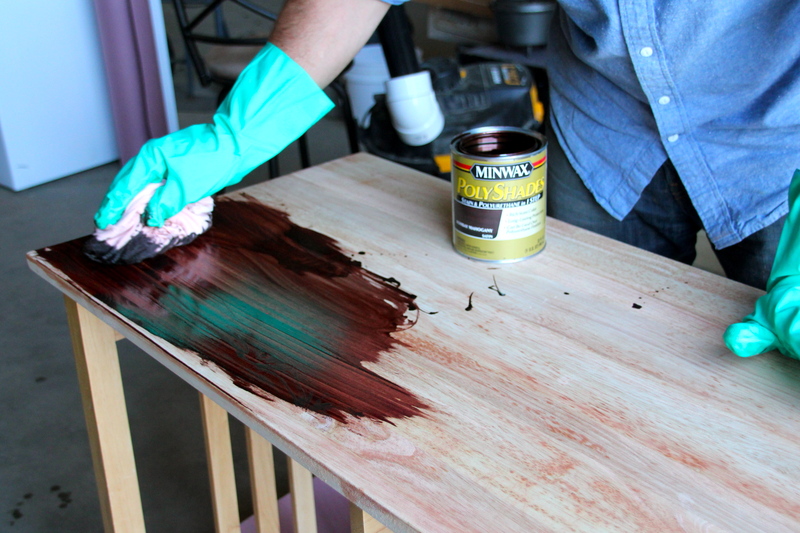 Next, we stained and painted the desk. After a few tries finding the right stain color for the top, we chose a beautiful rich color called simply Walnut and applied two coats. 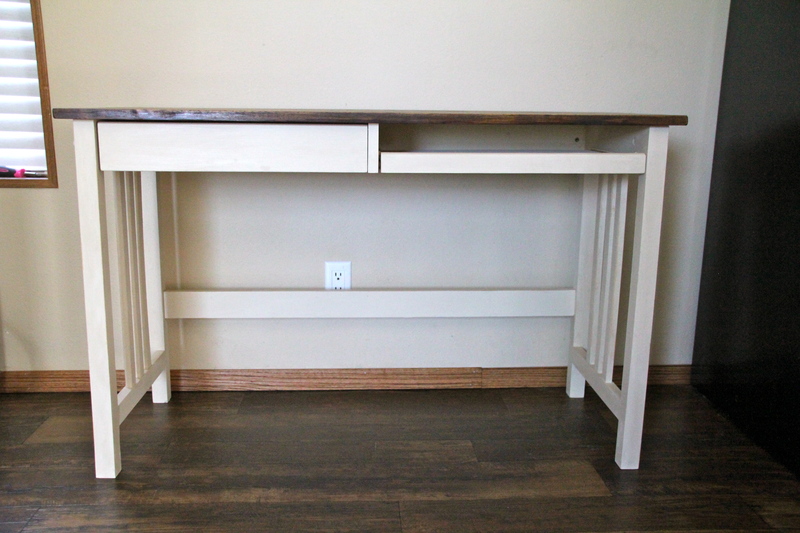 We only used one coat of chalk paint for the base of the desk. We quickly found out that you do NOT need to over-apply this paint! A little goes a long way. In fact, right away I tried putting it on a bit too thick. I quickly realized that this only led to noticeable build-up and paintbrush lines that I didn’t want. Applying a thin layer worked much better. It was amazing, actually, how little paint it took to cover the whole thing. 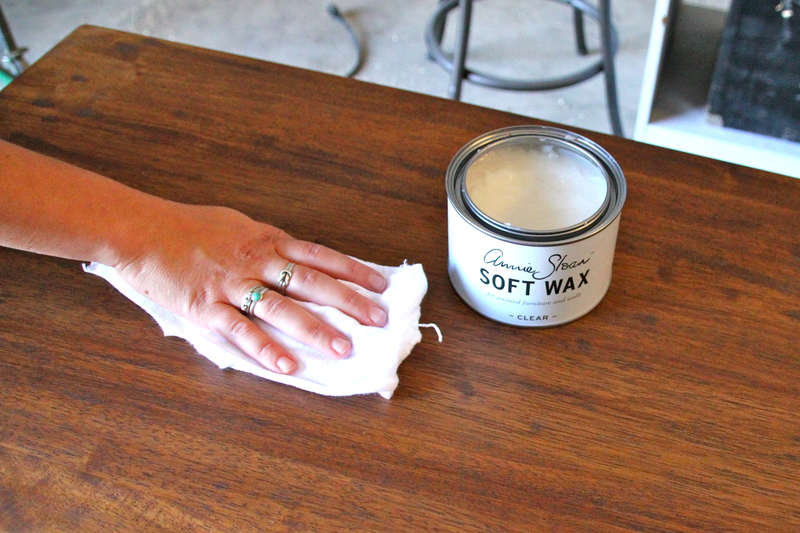 After that, we applied the Annie Sloan soft wax, which is a protectant for the chalk paint. I was a little uneasy about this step, but it turned out to be the easiest step of all! You simply use a rag or a wax brush to massage the wax into the wood. It was a lot like applying lotion. (I heard that on one of the tutorials I watched, and it made a lot of sense!) I used a discarded t-shirt cut up into rags to apply the wax, and it worked just fine. Finally, we reattached the drawers and took the old girl back home. I absolutely LOVE how it turned out! It looks so much better in our living area. 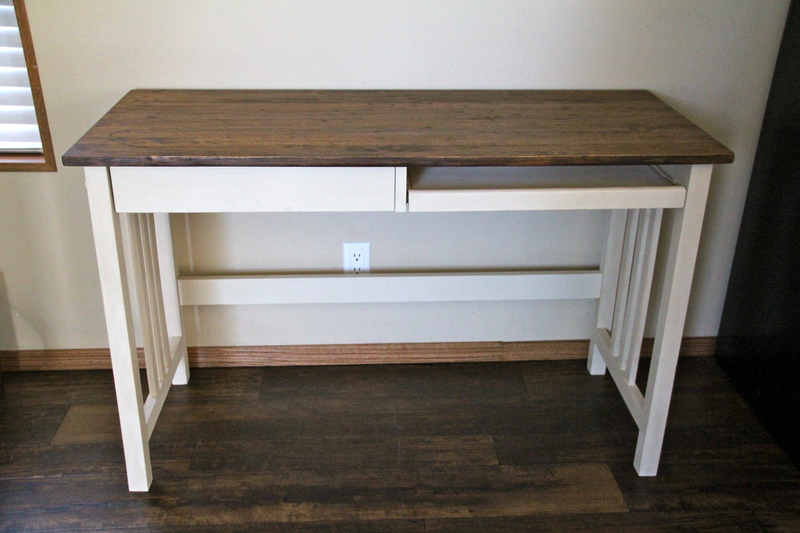 The wood top matches a lot of our other pieces well, and I love the pretty look of the Old Ochre chalk paint. Perfecto! I am especially happy because I have my little work space back again just in time for the school year to start! I envision myself spending a lot of time here this year. You should try it! Happy painting!